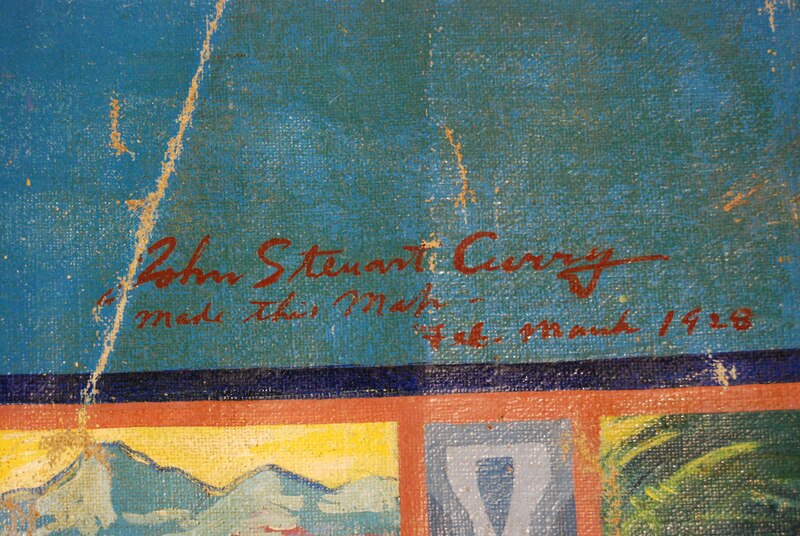 Artist John Steuart Curry was born on a Kansas farm in 1897 as the eldest of five children. He grew up painting the farm’s animals and admiring reproductions of work by Peter Paul Rubens and Gustav Doré in his childhood home, both of which influenced his later style. Curry attended the Kansas City Art Institute prior to transferring to the Art Institute of Chicago and, upon graduation, he created illustrations for notable magazines including Boy’s Life and The Saturday Evening Post. In 1926, he traveled to Paris to study the works and techniques of artists including Gustave Courbet, Honoré Daumier, Titian and Rubens. The Federal Art Project began creating Depression-era employment artists in 1934; by 1936, Curry had been commissioned through the Project to paint murals for Washington, D.C.’s Department of Justice Building and Main Interior Building. He died in 1946 after leaving his artistic mark as a prominent painter and muralist. 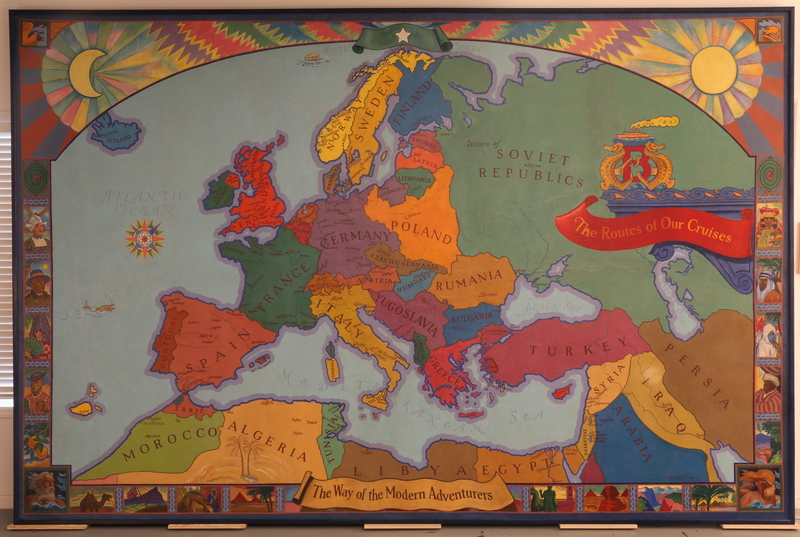 The painting was originally commissioned for and installed in the offices of the James Boring Travel Agency. Located at the famed Crown Building at 730 Fifth Avenue, New York, NY – a Manhattan landmark distinguished by its proximity to Central Park and distinct gilded “crown” top designed by Grand Central Terminal architects Warren and Westmore. 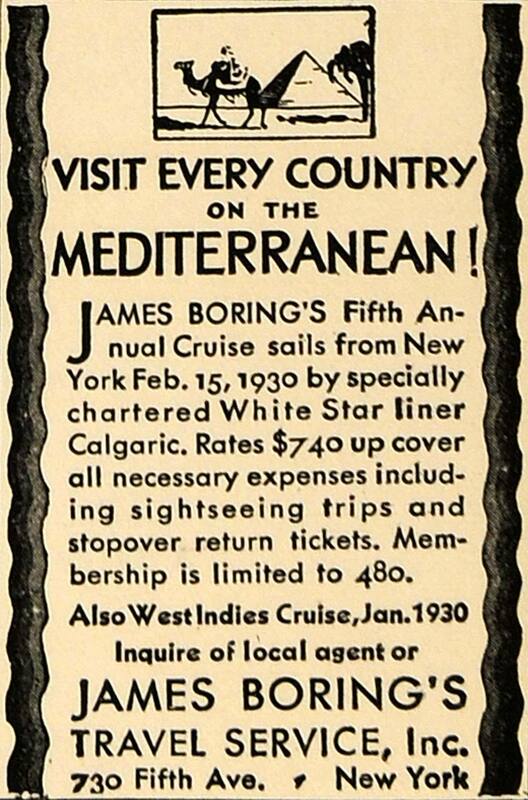 Boring’s travel agency headquarters coordinated luxury first class-only cruises to dozens of exotic countries and ports throughout the Americas, Europe and the Mediterranean. 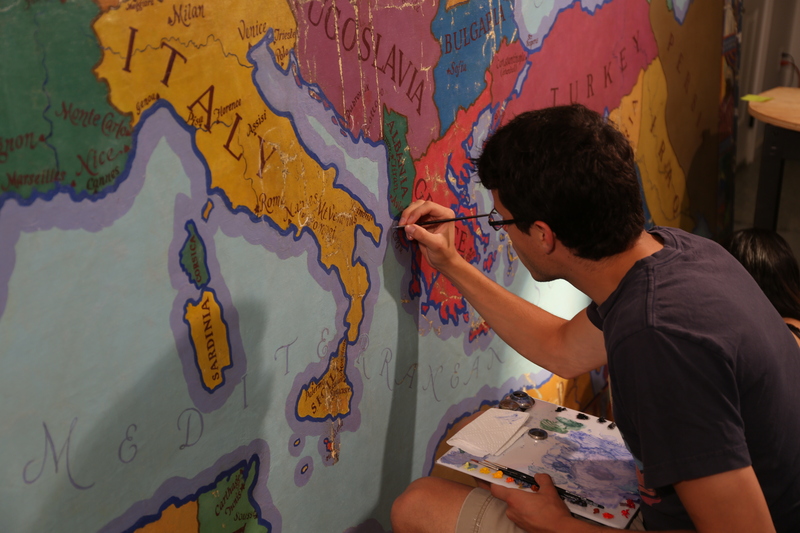 This painting depicts the routes of his world cruises. 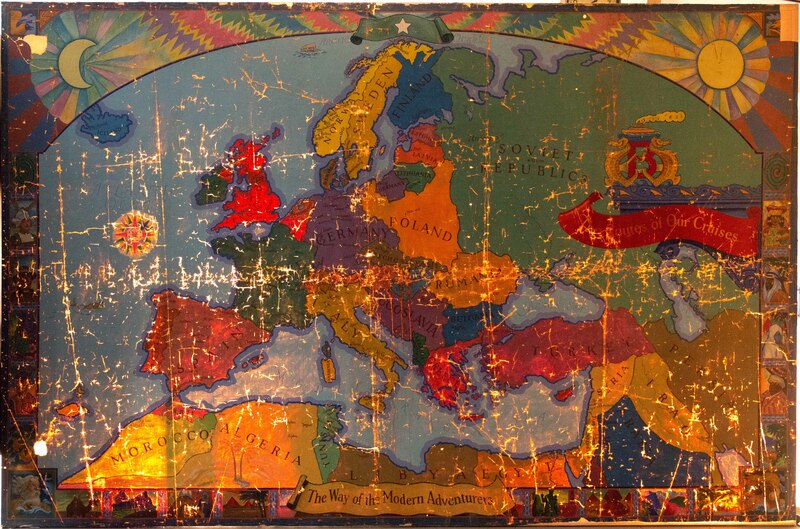 There was once a companion piece depicting North America; however, its whereabouts and condition are unknown. While his travel agency went bankrupt in 1937 due to a large Austrian investment that was unfortunately timed just prior to Hitler’s invasion, Boring lived a charmed life that included training Ernest Hemingway in crime journalism at the Kansas City Star; serving as an Army Captain during World War I; and successfully restoring and flipping old homes in Bucks County, PA after a brief radio stint at NBC News. Although the painting did maintain some of its original integrity, it was no longer capable of sustaining its own weight. The painting had many crease and fold lines throughout (mostly vertical) with associated paint and ground loss. 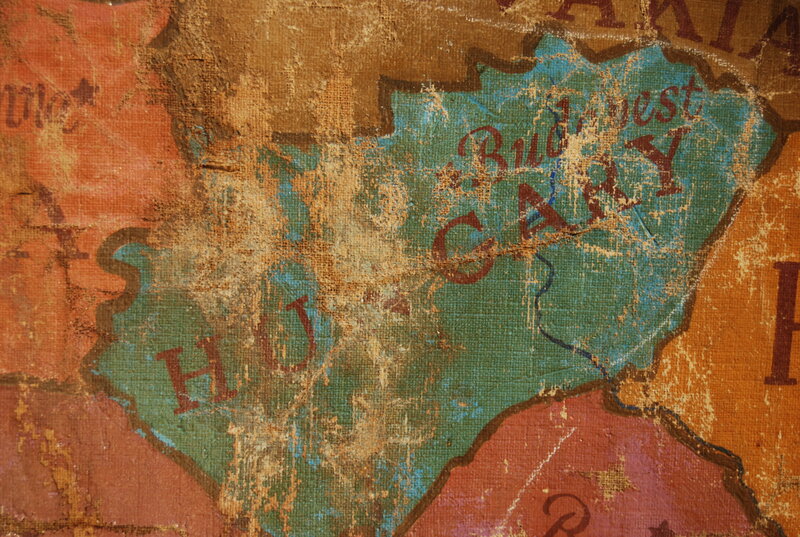 The canvas was severely weakened along all of the folds and creases, with some breaks in the canvas in these areas. There were many edge tears ranging from ½” to 20” around all four sides of the painting, with many small folded-over sections of painting canvas associated with the edge tears. There were many minor canvas losses and four major canvas losses: 1) a 5” x 6” loss near the upper proper right corner; 2) a 6” x 9” rectangular loss in the upper proper left corner; 3) a 2½” x 3” loss near the lower proper right corner; and 4) a 1¼” x 60” loss along the bottom edge, beginning with the proper left corner. A deteriorated layer of paste and small remnants of wallpaper was still extant, suggesting that the painting was attached to the wallpaper covering on a wall with wallpaper paste at one point. This may have occurred at its original display location at the travel agency offices. The wallpaper did not appear to have color or ink on it. Tacks were used to hold the painting on the wall in addition to the paste, as shown by tack holes around the edges of the painting. A molding was then nailed over approximately 1½” to 2” of the edges of the painting. A 1” section of discolored varnish can be seen on all edges outside of the painting border strip. The bottom and top of the painting still retained a 1” primed but unpainted tacking margin. This was not present on the sides. 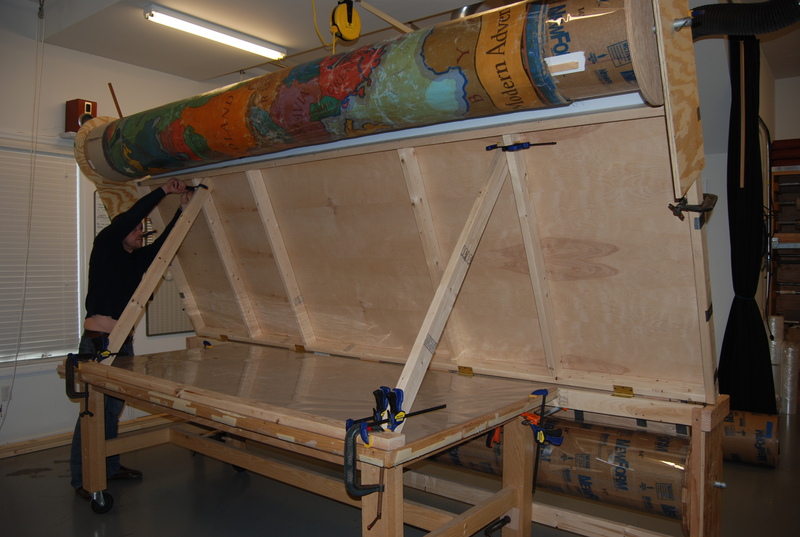 The painting was carefully unrolled from the tube while being vacuumed from its reverse side. A custom scroll-like jig was designed and built so the painting could be rolled face-out on two larger diameter tubes covered in Mylar. This system safely supported the fragile painting and allowed for sections of the canvas to be rolled and unrolled to accommodate cleaning, paint consolidation, tear repairs, canvas inserts, and other localized treatment. Surface dirt, discolored varnish, staining, surface accretions, and dirt embedded in the structure of the paint were removed with a combination of organic and aqueous solvents, solvent mixtures, and gels. This cleaning process took nearly 90 hours for conservators to complete. Canvas folds and creases were locally relaxed with controlled moisture, covered with acid-free blotters, and placed under light weights until dry. Areas of flaking paint were locally consolidated using appropriate conservation-grade adhesives and varnish coatings. A table-mounted scroll jig was built to facilitate the removal of the wallpaper paste and remnants from the reverse side of the canvas. Full removal of the wallpaper remains was necessary to prevent any visual lumps from being created on the front of the painting as a result of the lining process, when a secondary canvas would be attached to help support the painting. Mold spores were neutralized and removed from the canvas by solvent application. All canvas tears, breaks, and weakened folds were joined and mended using a conservation-grade adhesive. Canvas inserts were also attached to replace missing areas of the canvas. A secondary lining canvas was prepared with an infusion of wax resin adhesive. 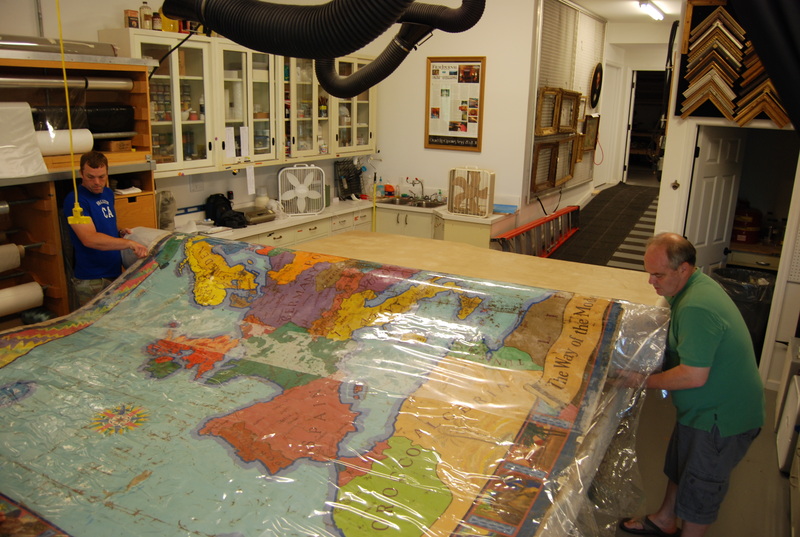 The painting was carefully unrolled onto the vacuum hot table and infused. The adhesive served to further consolidate and flatten the canvas and paint. 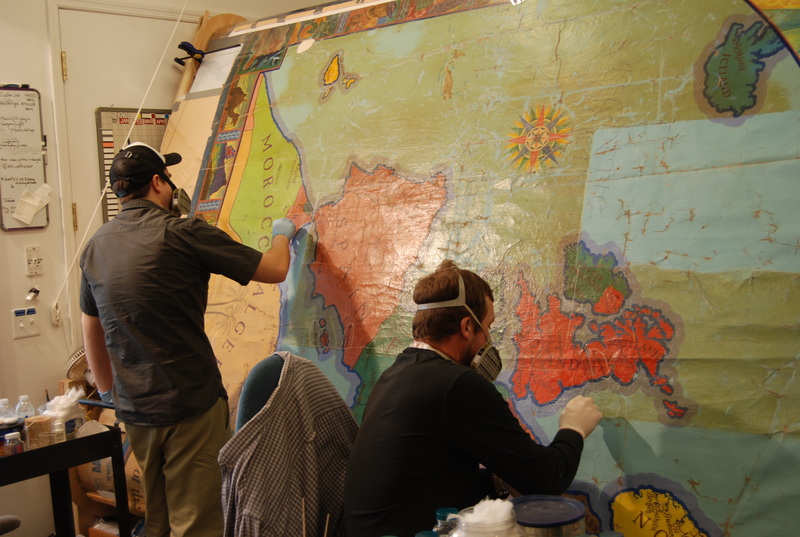 The prepared lining canvas was attached to the painting using a thermoplastic adhesive and controlled heat. The lined painting was stretched onto a new custom poplar stretcher with expansion bolts and stretcher bars. The painting was secured with staples and keyed out to make it taut on the stretcher. An isolating layer of spray varnish was applied to the painting to separate the original artist’s work with that of the conservator. All losses were filled with gesso. Losses, abrasion and any unremovable staining was then inpainted with conservation-grade paints, an extensive process which took about 300 hours to complete. A final combination of spray varnish and brush varnish coatings was applied to the painting. 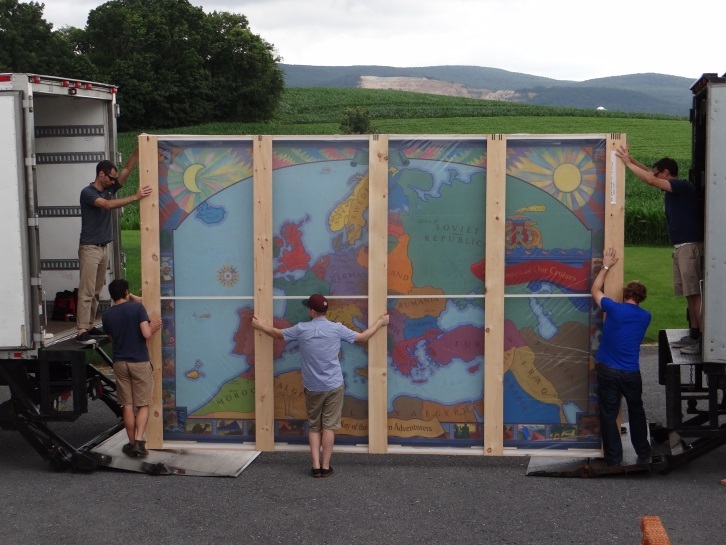 A backing board of corrugated inert plastic was added to the back of the painting, along with handles for stable handing of the large mural. 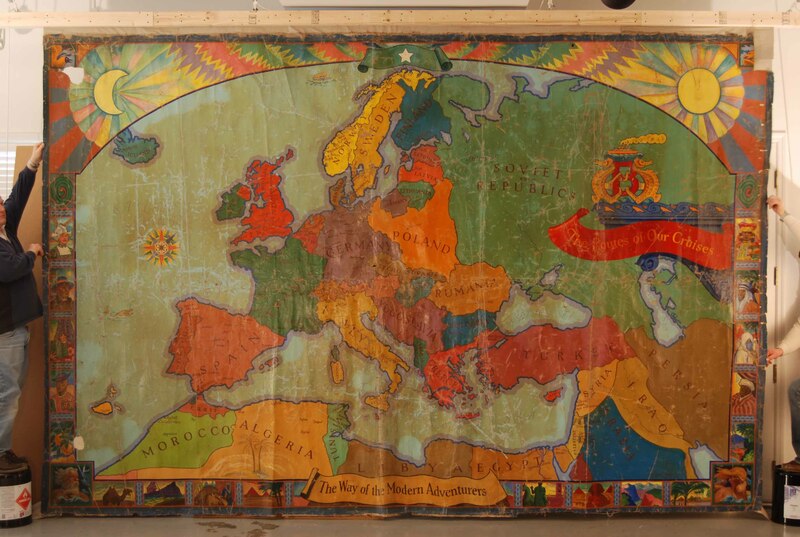 The painting was then shipped to Kansas State University, where it is currently on display at the Marianna Kistler Beach Museum of Art.